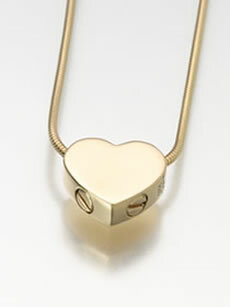 The Heart Slide Double Keepsake Urn is available in Sterling Silver (upper photo) or Gold Vermeil (lower photo). The vermeil urn is plated with 100 milligrams of gold, the best grade of plating available. There are two openings in this pendant (on the sides of the heart so the front and back can be engraved by your local jeweler) to allow for a very small amount of cremains, dried flower petals, or other remembrance to be added.